Dec. 7, 1941: View of Pearl Harbor looking southwesterly from the hills to the northward. Taken during the Japanese raid, with anti-aircraft shell bursts overhead. 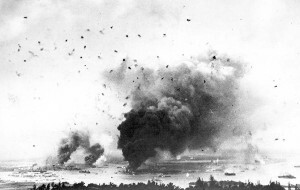 Large column of smoke in lower center is from USS Arizona (BB-39). Smaller smoke columns further to the left are from the destroyers Shaw (DD-373), Cassin (DD-372) and Downes (DD-375), in drydocks at the Pearl Harbor Navy Yard.